What do you give a robot when it takes its first steps like a human? Its first pair of shoes. Georgia Institute of Technology researchers have created what they say is the most efficient-walking humanoid ever created. 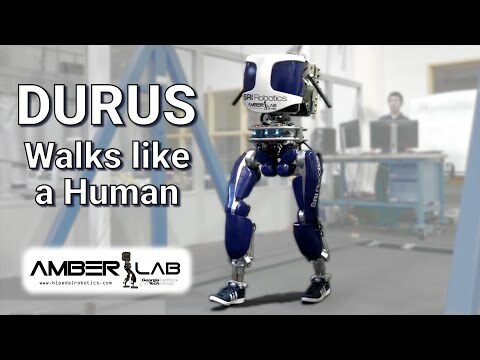 While most machines these days are hunched at the waist and plod along on flat feet, Georgia Tech’s DURUS strolls like a person. Its legs and chest are elongated and upright. It lands on the heel of its foot, rolls through the step and pushes off its toe. It’s even outfitted with a pair of size-13 shoes as it walks under its own power on a treadmill in the team’s AMBER Lab. As Ames tells it, the traditional approach to creating a robotic walker is similar to an upside-down pendulum. Researchers typically use comparatively simple algorithms to move the top of the machine forward while keeping its feet flat and grounded. As it shuffles along, the waist stays at a constant height, creating the distinctive hunched look. This not only prevents these robots from moving with the dynamic grace present in human walking, but also prevents them from efficiently propelling themselves forward. The Georgia Tech humanoid walked with flat feet until about a week ago, although it was powered by fundamentally different algorithms than most robots. To demonstrate the power of those methods, Ames and his team of student researchers built a pair of metal feet with arched soles. They applied their complex mathematical formulas, but watched DURUS misstep and fall for three days. The team continued to tweak the algorithms and, on the fourth day, the robot got it. The machine walked dynamically on its new feet, displaying the heel-strike and toe push-off that is a key feature of human walking. The robot is further equipped with springs between its ankles and feet, similar to elastic tendons in people, allowing for a walking gait that stores mechanical energy from a heel strike to be later reclaimed as the foot lifts off the ground. This natural gait makes DURUS very efficient. Robot locomotion efficiency is universally measured by a “cost of transport,” or the amount of power it uses divided by the machine’s weight and walking speed. Ames says the best humanoids are approximately 3.0. Georgia Tech’s cost of transport is 1.4, all while being self-powered: it’s not tethered by a power cord from an external source. This new level of efficiency is achieved in no small part through human-like foot behavior. DURUS had earned its new pair of shoes. He adds these advances have the potential to usher in the next generation of robotic assistive devices like prostheses and exoskeletons that can enable the mobility-impaired to walk with ease. The student team was led by graduate student Jake Reher. The shoes were created by another graduate student, Eric Ambrose. DURUS was designed in collaboration with the robotics division of SRI International. The project is supported by the National Science Foundation under Grant No. 1526519. Any opinions, findings, and conclusions or recommendations expressed in this material are those of the authors and do not necessarily reflect the views of the National Science Foundation.